There’s nothing to better prepare you for ROYAL WEDDING as an inexperienced musical watcher than that tagline, really. It’s a viewing experience from a completely different cinematic world than the one we have in 2013*. I like musicals, although I’ve never really delved deep into the genre per se. My biggest exposure has no doubt been Gene Kelly, more specifically SINGIN’ IN THE RAIN and AN AMERICAN IN PARIS. ROYAL WEDDING was my first Fred Astaire movie. Astaire is a bit of a weird looking guy to be a movie star, huh? I mean look at him up there! He’s perfectly charming and a great performer and all that, but it just makes you think how homogenous movie stars in our day are. Think of Astaire, Cagney, Harlow… those were some WEIRD looking motherfuckers! 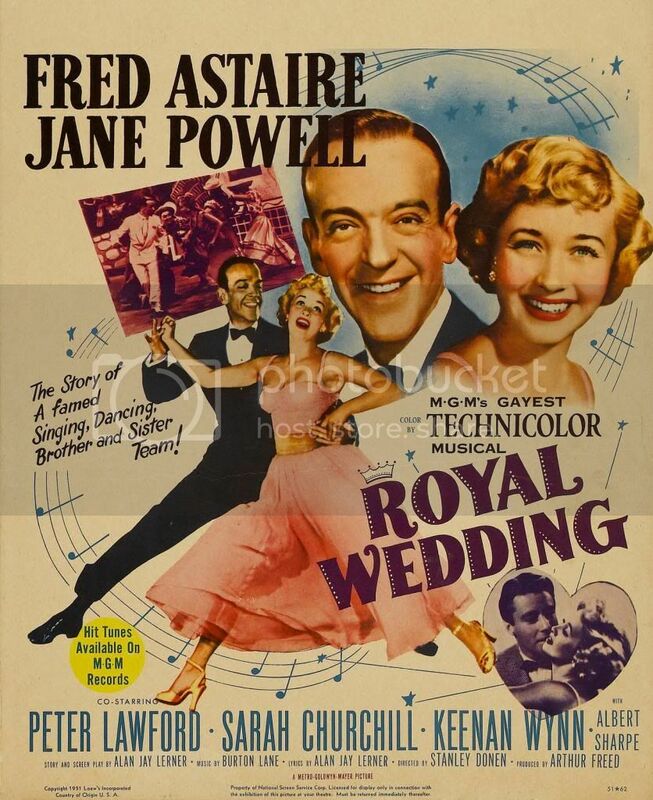 The plot of ROYAL WEDDING (such as it is) has Astaire and co-star Jane Powell as a brother-sister dancing duo, hitting it big on Broadway. Their agent comes to inform them that their numbers are so good, he can get them to perform in LONDON, ENGLAND, don’tchaknow! Powell leaves behind three suitors who end up engaging in fisticuffs on the very shore when the boat leaves with the siblings. What a wild dame, especially for a 1951 movie! Now, the concept of a brother-sister dancing duo is pretty weird in and of itself, I think – especially considering that they’re playing a flirting king and maid in the opening number! But Astaire is super adamant about them both not getting married, cuz it just wouldn’t fit their lifestyle. Suitors and beaus and whatnot, all good and well, but don’t you settle down, missy! So, of course, over the course of the film, they both meet that Special Someone to make them settle down, Powell in an impoverished lord played by Peter Lawford and Astaire in a barkeep’s daughter (Sarah Churchill). There is a minimum of conflict in these relationships; Powell/Lawford’s big obstacle is that Astaire doesn’t approve (“Nothing serious!”), Astaire/Churchill’s problem is that she’s already with someone. Okay, that last one would seem pretty big, but you know how it gets solved? SPOILERS, I guess! Astaire has his agent call some guys in the US (the rival is in Chicago) and see what he’s up to. Turns out, the fellow married someone else a few months ago! Well, that’s convenient! Wait a minute, how are we filling up a 93 minute movie here? Sounds like someone forgot that it’s a MUSICAL! ROYAL WEDDING is a charming little movie from a bygone age that maybe isn’t THAT different from the cinematic age in which we live now. I think the (pre-STAR WARS) 70s are probably far more different to what’s in theaters now than the musical age ever was. Does that mean this DVD was just transferred from a VHS and ROYAL WEDDING wasn’t the first thing on it? Is CLASSIC MOVIES into more sinister dealings than selling cheap, ugly transfers of classic movies? What? WHAT????? I will not stop my investigations until I feel the puppies lapping at my toes, dear reader, you may rest assured of that! *Although you could argue that big blockbuster action movies have basically supplanted the musical as the dominant form of cinematic comfort food for mainstream audiences. How many times over the past decade have YOU gone out to see a young man gain powers, assume a super-identity and fight some equally powered-up bad guy? Consider this before dismissing the Hollywood musical!